immediately that Wallace was something special. While on his honeymoon, Roo learned that Wallace was about to be put down. Frantic—and even though they already had two dogs—Roo and his wife fought to keep Wallace alive until they could return home to adopt him. Once Wallace made it home, Roo knew the dog needed a mission, and serendipity led them to the world of competitive Frisbee dogs. It seemed like a terrible idea. Pit bulls are everything that most Frisbee dogs aren’t: large and heavy with thick muscles that can make them look less than graceful. But after overcoming everything from injuries to prejudice against the breed, the unlikely pair became World Champions. 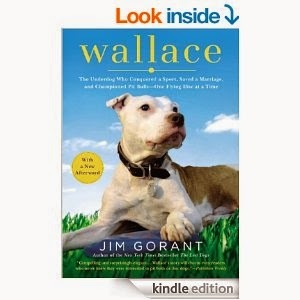 Movingly told by bestselling author Jim Gorant, Wallace will capture the hearts of animal lovers everywhere—and help rescue this popular breed’s unfairly tarnished reputation. Aaah, the rise of the underdog! Those of us volunteering in dog rescue are familiar with Wallace and his story. And what a story it is! An unwanted American pit bull terrier, stuck in a shelter, and on the fast track to euthanasia, Wallace rose to stardom, become a flying disc world champion. Wallace did wonders proving the nay sayers with their opinions about pit bulls wrong-a mission his owners continue to this day. This book gives good insight into his transformation from a shelter dog deemed a "liability" to world champion. Inspirational and entertaining, I highly recommend this for anyone who loves dogs, especially pit bulls-and for those who are biased against them! Disclosure: I did not receive the item(s) mentioned in this post for free, but spent my own money. Regardless ~ All my reviews are my honest and personal opinion. I am disclosing this in accordance with the Federal Trade Commission’s 16 CFR, Part 255: “Guides Concerning the Use of Endorsements and Testimonials in Advertising.”.